Molecular Testing for Large Granular Lymphocyte Leukemia is a genetic test that is helpful in aiding a diagnosis of large granular lymphocyte leukemia. The cause of large granular lymphocyte leukemia may be due to genetic mutations. The methodology used for large granular lymphocyte leukemia may vary from one laboratory to another. What are the Clinical Indications for performing the Molecular Testing for Large Granular Lymphocyte Leukemia Test? 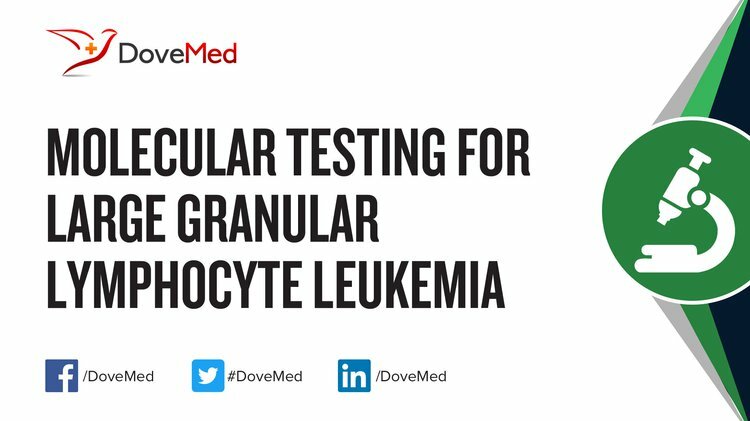 How is the Specimen Collected for Molecular Testing for Large Granular Lymphocyte Leukemia? What is the Significance of the Molecular Testing for Large Granular Lymphocyte Leukemia Result? Koskela, H. L., Eldfors, S., Ellonen, P., Van Adrichem, A. J., Kuusanmäki, H., Andersson, E. I., ... & Majumder, M. M. (2012). Somatic STAT3 mutations in large granular lymphocytic leukemia. New England Journal of Medicine, 366(20), 1905-1913. Fortune, A. F., Kelly, K., Sargent, J., O'brien, D., Quinn, F., Chadwick, N., ... & Thornton, P. (2010). Large granular lymphocyte leukemia: natural history and response to treatment. Leukemia & lymphoma, 51(5), 839-845. Watters, R. J., Liu, X., & Loughran Jr, T. P. (2011). T-cell and natural killer-cell large granular lymphocyte leukemia neoplasias. Leukemia & lymphoma, 52(12), 2217-2225. Chen, Y. H., Chadburn, A., Evens, A. M., Winter, J. N., Gordon, L. I., Chenn, A., ... & Peterson, L. (2011). Clinical, morphologic, immunophenotypic, and molecular cytogenetic assessment of CD4–/CD8–γδ T-cell large granular lymphocytic leukemia. American journal of clinical pathology, 136(2), 289-299.